The slightest hint of weakness or lack of resolve on this issue will not bode well for your country. Stand firm, and let the rest of the world know about this territorial aggression. Although I personally don't hold the "United Nations" in very high regard, shouldn't they be dealing with this act of territorial aggression? Just like that? Has it been brought to the agenda then? Philippines is a UN member, but has there been a statement from its UN representative? China, don't think they want to get UN involved. 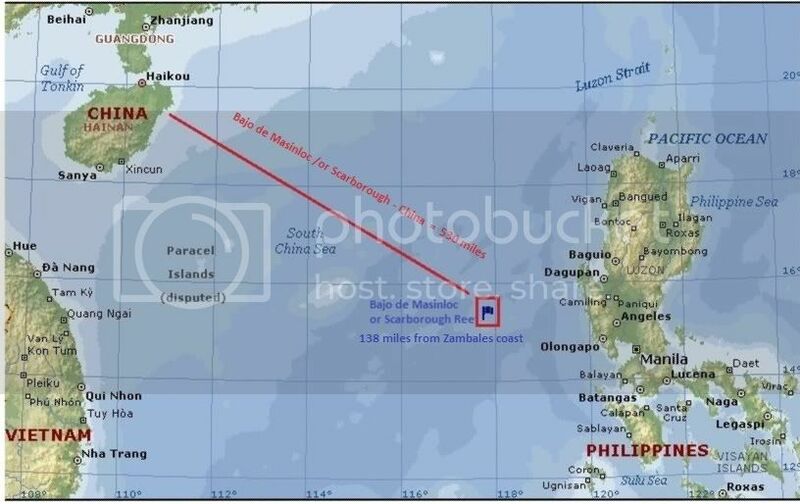 I suppose the US could bring it up, but China would start easily with the fact that the US is doing wargames with the Philippines in the area, the US rather shows its military presence than get the UN involved. So, who will bring it to the table then? I actually don't really know when the security council comes into play, wouldn't this just be a case under international law first? It seems this is still pretty much on the diplomatic level between nations, with neither sides taking the steps to take it to the international level. So then the UN doesn't get involved until it goes wrong. In addition to the absurd claims of "sovereignty" over the Island and reefs, the threat in the newspaper of the PLA was absolutely astounding! The claim that china's 'sovereignty" is being challenged is a typical reversal of reality by china, and a transparent attempt at territorial expansion. There is also the issue of the upcoming chinese party congress, which could cause divisiveness in china, and this cheap attempt to incite nationalistic pride as a unifying factor can be seen as an indication of uncertainty about the outcome of the party congress. Where is the Jasmine Revolution when it is needed? So, ManilaBoy45, what ships and forces does your nation have on hand to repel this aggression? I would assume the chinese have dispatched a submarine to the area in another escalation of this conflict, an escalation that will not be seen by casual observers, but there, nonetheless. All this is right out of Sun Tsu. I urge people of the Philippines to stand firm and not to worry over a few bananas rotting on a pier in china, or fewer chinese "tourists"
But that congress is getting delayed because of internal debate, so even if it's just that, this will still last for months. I would assume the chinese have dispatched a submarine to the area in another escalation of this conflict, an escalation that will not be seen by casual observers, but there, nonetheless. USS North Carolina will find it then, not really casual... but an observer nonetheless.